Choral Music in South Africa is on a high level and in great demand. South African children’s and youth choirs are amongst the best in the world. However, teachers ask for more and regular training, workshops and exchange possibilities. Die Stellenbosch Kunswedstryd and Stellenbosch University’s Division for Choral Music join forces to provide school teachers, choral conductors and church musicians with inspiration and support for their committed and excellent work for Choral Music in South Africa. Our challenging task is to take methodical and technical problems from different professional perspectives into view. 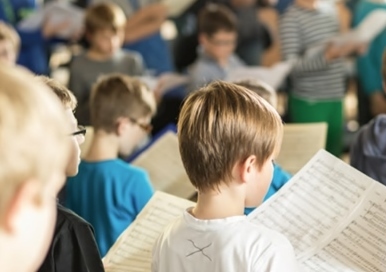 The target group is choral conductors, church musicians, school teachers and all, who are interested in a one-day choral music masterclass on a high level. The workshop will target problems of Primary and High school Choirs. Stellenbosch University’s Division for Choral Music aims to strengthen the link between academic education and the professional life. Interaction and interchange is the key to success in all fields. In the long run, this forum wants to become a place of exchange and knowledge which aims to be at the forefront of a new and modern choral pedagogy. New concepts of teaching methods, vocal education and choral conducting will enrich and inspire participants and their work. Martin Berger, Head of Choral Music at the SU Music Department, who joined the University in 2013 will be the main presenter of the new series of workshops over the coming years. During his time as Director of Music at Würzburg Cathedral (2002 – 2013) he developed the Cathedral’s music to one of the foremost institutions of its kind in Germany. Over 500 singers were regularily singing and performing in four choirs (Boy’s choir, Girl’s choir, Cathedral Choir and Chamber Choir) under his baton. More than two third of them were under 20 years old. As a professor of choral pedagogy at the Robert Schumann Hochschule in Düsseldorf from 2008, he developed and taught modern methodical techniques for the mediation of choral music. Martin will be supplemented by experts from inside and outside South Africa. The balance between academical lecture and practical training will create a vital and lively atmosphere for participants. With Schola Cantorum, the academic chamber choir of the Music Department, as choir in residence, all participants will get the opportunity to experience efficient conducting techniques on a high level. Included lunch and refreshments create opportunities for discussion and recreation in between the lectures.